Here's another flashy way to cut a deck that’s harder than the pivot cut. The upper half of the deck turns 180-degrees as it separates from the deck. Hold the deck face-down in your right hand with your fingers on the forward edge and your thumb on the back edge. Notice how your right index finger curls on top of the deck. Magicians call this a “Biddle Grip.” You’re ready to cut the deck. If you’re left-handed, simply reverse the instructions. Using your left hand, touch the top knuckle of your left first finger against the upper half of the back side of the deck, the edge that is nearest you. Try to aim for the left-most corner of the deck. With the top knuckle of your left first finger, push against the back edge of the deck and swing the upper half in a clockwise motion. 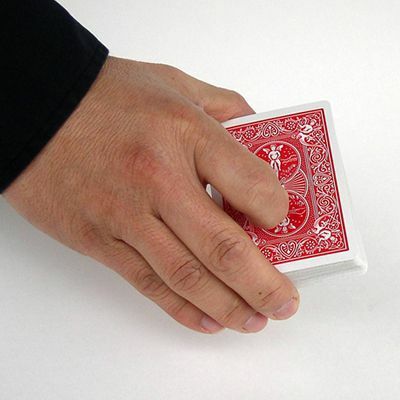 The middle finger of the right-hand acts as​ a support for the upper-half of the deck during this motion. As the upper of the deck pivots away from you, catch the packet in your left hand. The upper half of the deck will effectively spin 180-degrees. With the original upper half of the deck now in the left hand, place the bottom half that's held in the right hand on top to complete the cut.